It’s got an interesting enough premise, but no the follow through or ending to make this thing truly worthwhile. This is the movie that brought two amazing, A list stars of red hot talent and popularity together, in what was meant to be a fun sci-if romance. It didn’t work. The casting might be great, and so are all the futuristic ideas, but the movie has a very simple and straight forward plot. Once it hits all the usual, obvious, and predictable story points, it is left with nowhere else to go. 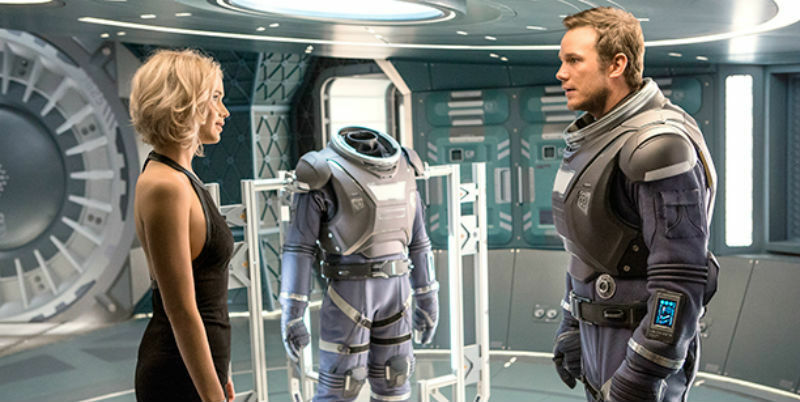 Passengers is a movie with endless levels of potential, and yet somehow it finds itself with nowhere to really go. The setup and initial premise here couldn’t be much cooler. A man wakes up on a spaceship where he was supposed to be asleep for the next eighty years. Now he’s the only one awake, stuck alone for eighty years, on board this huge, empty ship (there are other passengers, but they are all asleep, for their own eighty-year nap.) So this guy, Jim, (Chris Pratt,) wakes another passenger up to keep him company. 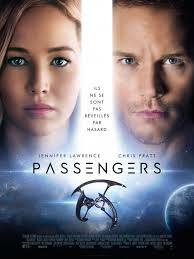 The passenger he wakes up is Aurora, (Jennifer Lawrence.) She’s beautiful and fun, and Jim gets to know her a little bit through videos before waking her. And once he wakes her, he’s got company, and everything seems better. Especially when their friendship turns into a romance. But there’s s problem. Aurora thinks her waking up was a mistake. She thinks her sleep pod malfunctioned like it did for Jim’s. The truth is, Jim woke her up and Aurora doesn’t know it. The reason why this is such a huge deal, is because by waking her, Jim basically stole Aurora’s life. He took away the life she had planned for herself. The idea here is that all of these passengers are traveling to another planet. When they get there, it will be about eighty years later. And now, since they are awake on the ship, Jim and Aurora will spend those eighty years (the rest of their lives,) on the voyage to the planet. So by waking Aurora up, Jim has pretty much stolen her future. So that’s the premise. And if you think about any movie where there’s a secret, where there’s a romance and one character thinks they met by accident while the other one is lying the whole time, (you ever notice it’s almost always the guy who is lying?) Then you know what’s going to happen. You know that it’s only a matter of time before the girl learns the truth. Just like it always is. So the question then is, what else does this movie have going for it? And the answer is sadly, not a whole lot. To go back to the beginning, this thing really was loaded up with tons of potential. First off, with Chris Pratt and Jennifer Lawrence, you’ve got the youngest, hottest A list movie stars in the world. Each one of them has carried one or two uber-popular franchises already, be it The Hunger Games movies or the Guardians of the Galaxy films. Each one has been a part of other giant success stories, ((Jennifer Lawrence is an Oscar winner who has also been nominated a bunch of times, Chris Pratt took Jurassic World to a place of success where the franchise has not been in decades.) Now, casting is just the beginning of putting a movie together, but this movie definitely got the cast of its dreams. And the idea about Jim waking up is pretty great too. For one thing, it puts the audience into a “what would you do,” kind of situation. If you woke up eighty years before you should have and were all alone on this ship, what would you do? And then it’s also great because it gives us the ability to see Jim go touring and exploring the ship, taking advantage of all its amenities, and having loads of fun. Think of it like the start of I Am Legend, where the character is left to himself in a deserted future world. And what really works about this is that it’s the future, so the possibilities are endless. Jim walking around the ship and finding different rooms and places to do things is like the walk from one train car to the next in Snowpiercer. Only that movie got much more creative with it. In this movie, we only get a handful of rooms. There’s the basketball playing room (with a virtual crowd that appears on the walls and cheers,) there’s the dance competition room (again, virtual applause and backgrounds,) there’s the Japanese restaurant with robot waiters, there’s the pool which overlooks outer space with a giant window that you can swim right up to, and then there’s the bar. Here Jim meets a bartender named Arthur (a robot,) who becomes the only one for him to talk to. The rooms are cool, but the movie should have done more with them. It feels like each one of them is briefly shown to us, without really being explored. And before you know it, Jim is waking up Aurora and we are rushing towards a storyline with no real ending. Why not have more fun with the rooms and the life on a deserted ship? Cast Away did it without all the futuristic ideas to play around with. There comes old even be some scariness to it, Event Horizon style. But this movie wants to get the two leads on screen together as fast as possible and so it brings Lawrence in as quickly as it can. So Jim wakes her up, they start a romance, and we get all the usual cliches. Two characters fight and go their separate ways. Then they make up and get back together. And then thrvmonie is l ft with nothing else to do. So the ship starts falling apart. That’s it. This becomes the climax and the storyline for the final fourth of the film. The two of these characters have to save the ship. It feels incredibly forced, and almost like it’s not a part of the same movie. What would have been far more interesting would have been some kind of a twist about why Jim woke up. Why did his pod suddenly shut off? Maybe it could have been some puppeteers (the guys who own the ship transport company,) doing an experiment on him to see what would happen, Cabin in the Woods style. You go through this movie expecting there to be some kind of twist for why things happened, and you never get it. And that’s where the potential falls short and the movie drops the ball. There are so many possibilities for where this thing could have gone. Maybe it could have been Jim who set it himself, hoping not to reach the planet after all, because h was trying to forget something, Memento style. Or maybe it could have been that Jim and Aurora knew each other in a past life and has their memories wipes clean, (-style,) and the whole thing was a test to see if they would find each other again. The point is that there were tons of possibilities, and this movie chose none of them. Maybe there could have been one person who was going around waking all the passengers and Jim and Aurora found out and had to stop him. Ok, I better stop. 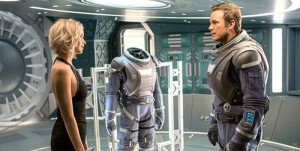 Passengers has an amazing setup, but no follow-through. It really is as simple as that.